In his interview with Rappler, Duterte said he is trying his best to fulfil his campaign promise to eradicate crime and drugs within three to 6 months. Barely two months since he took office, Duterte said he is working hard to give people what they want- a “drug-free, graft-free” country. "Ako (me), I would just say, I'm trying my very best, period. I do not claim any great success, maybe failures here and there," Duterte said. Here are some of the achievements and misses of Duterte, according to the PCO and a number of political analysts. 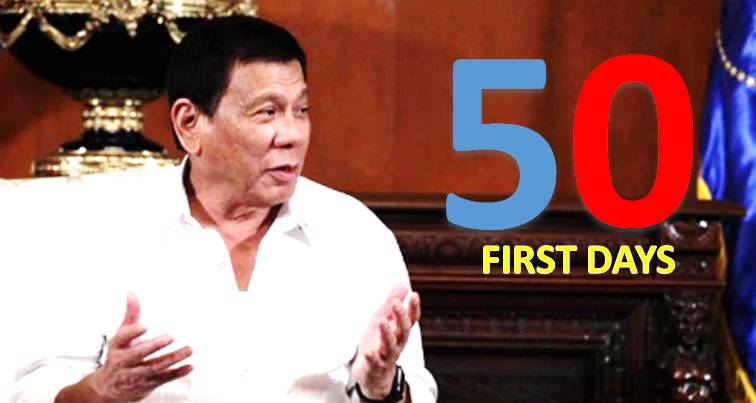 Several political analysts said Duterte’s first 50 days in power has a “strong start.” Describing Duterte as a very decisive president, Lyceum of the Philippines College of Law Dean Sol Mawis said the Chief Executive is already fulfilling his promises. Duterte’s landmark executive order on freedom of information was lauded by University of the Philippines assistant professor Jean Franco. His appointment of cabinet members was also commended by Franco who said Duterte’s economic team is composed of “competent” people including those recommended by communists. Franco added that the President’s appointment of celebrity personalities who campaigned for him was “ok” since their positions will not involve “life and death” situations. However, Franco pointed out that Duterte should have appointed a more experienced individual in the Department of Foreign Affairs. PCO Secretary Martin Andanar released a list of the President’s achievements in the early days in the office. Here are some of them, according to a report by Manila Bulletin. Despite his long list of achievements, Duterte’s all-out war on illegal drugs has earned criticisms from local human rights groups, lawmakers, the United States as well as international bodies such as the United Nations. The Senate has promised to look into the spate of extrajudicial killings of alleged drug personalities apparently linked to Duterte’s campaign. Analysts also believe that the planned hero’s burial for former President Ferdinand Marcos, his use of sexist language and his personal tirades against Senator Leila de Lima may decrease Duterte’s political capital.